No way! Jethro Tull was here! Jethro Tull and Meow Man! 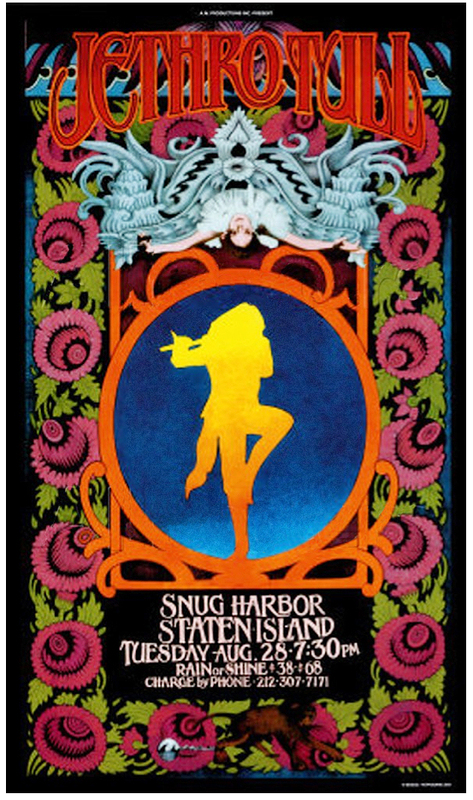 Bob Masse is the artist of this beautiful poster. Created in 1801, Snug Harbor was a retirement home for the captains and seamen of old whaling schooners (many coming from Gloucester!) The beautiful compound of elegant old buildings and grand old trees is located on the north end of Staten Island right on the Kill van Kull, and is a wonderful escape from city, containerports, tank farms and modern life. Committed to introducing arts, music, and maritime heritage, they offer classes, lectures, concerts and community events. And it is equally wonderful to indulge in none of that, and to just walk around; there is history in the place. The wonderful prints of John Noble are housed here, his ‘houseboat studio’ made from “the small bones of larger vessels” is reconstructed and open for exploration. Very good printmaking studio here. As Tugster says, there is simply no way to have enough fingers on the thousands of pulses of NYHarbor. I’m so sorry to report this great concert nine years late. But! don’t forget the Tug and Barge Fundraiser August 31! we’ll be there. Oh, we have so little to inspire one here. There were artist’s colonies at the turn of the century, but they are all gone now. What’s left costs money. Just wonderful. well, if you get a pitcher of julep and get us together for a nautical quilting bee, we can all potlatch and make it a party!!! I need to make a ditty bag and a new knife sheath! Wow. just got a chance to catch up with all the recent posts. Amazing… and what a great post on Staten Island!!! Well, it’s a tricky week with a month-end close to start & a boss about to go on maternity leave & the other boss just back from a week’s vacation, but I’ll see you guys tomorrow if there’s any way I can! btw, you would probably “like” my facebook update today! 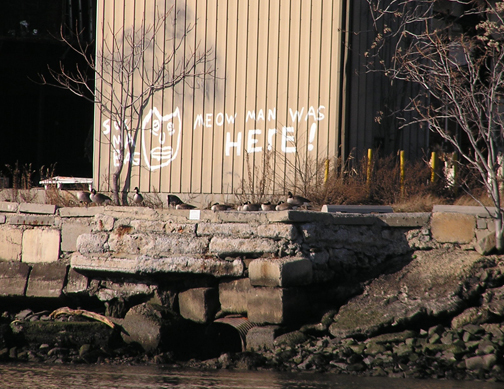 Meow Man was not a captain And has no relation with Erie Basin.It is true though that his “tag” did first find its way to the shorelines of New York and New Jersey in the late 80s. FACT IS, meow man was an out of work dock builder who would shape jobs via the water ways on his boat. The rumor I heard was that this job less man who was in his late 50s at the time he started to paint, would take LSD and go up and down the Harbor singing and” MEOWING” like a cat from boat.He soon after took on this new found identity as MEOW MAN!!! Then how do you explain his tag showing up all over the East and Gulf Coast? copy cats? 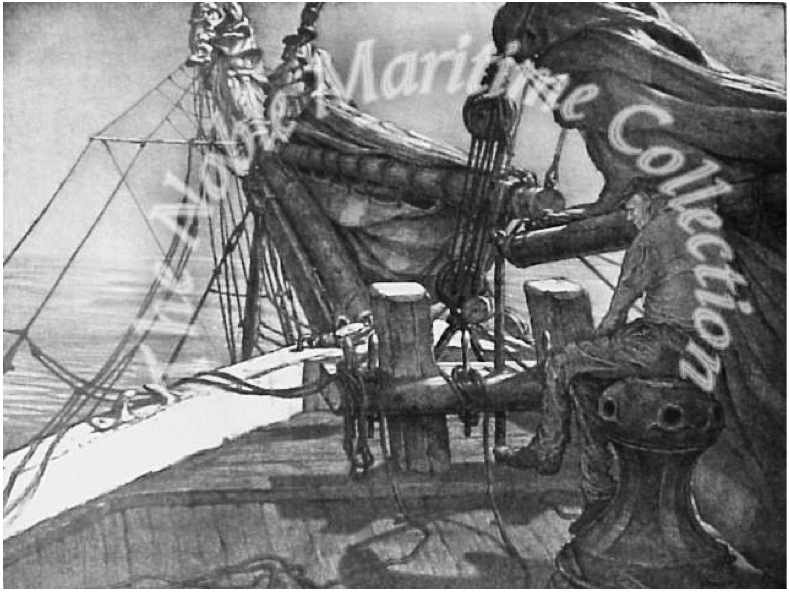 and all you need to do is listen to the range of accents on NY harbor aka sixth boro VHF to realize that someone here in july may very well have been in baltimore or tampa or galveston in june . . .